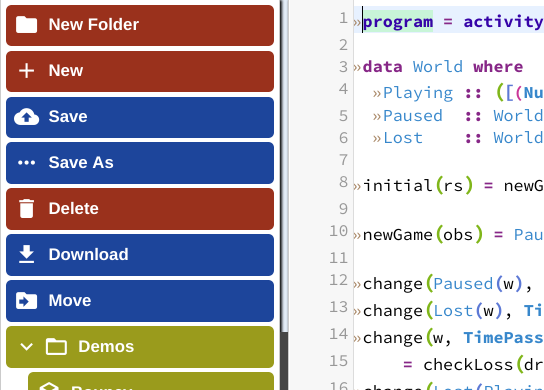 This is just a quick note that in CodeWorld, you can now share a folder as a gallery. If you do so, the contents of that folder will be available as a gallery link that lets others browse through your code. Although you can use CodeWorld for one-off tasks without logging in, this on will require logging in. So log in to your favorite dialect of CodeWorld. That’s http://code.world if you’re interested in using it for math education, or http://code.world/haskell if you want an idiomatic Haskell environment. You’ll need a Google account to log in. Step 2: Create a shared folder. To use this feature, you’ll need a shared folder, so let’s create one. Once you log in, you get the project browser sidebar, and at the top of that bar is a button labeled “New Folder”. After you’ve typed the name of your new folder, you should notice a button on the bottom toolbar to share your folder. You can click it now, but the folder that you share will be empty. You could put things in it later, of course, but let’s do it in the other order. So hold off on sharing for a bit. Alternative, if you’ve already got a folder of projects to share, skip ahead and you can share that instead. At this point, your newly created folder should be highlighted in yellow, meaning it’s open. As long as a folder is open, any project you save will be saved into that folder. If you closed the folder, though you might need to click the folder again to open it. Now that you’ve got projects in your folder, you can share the folder. 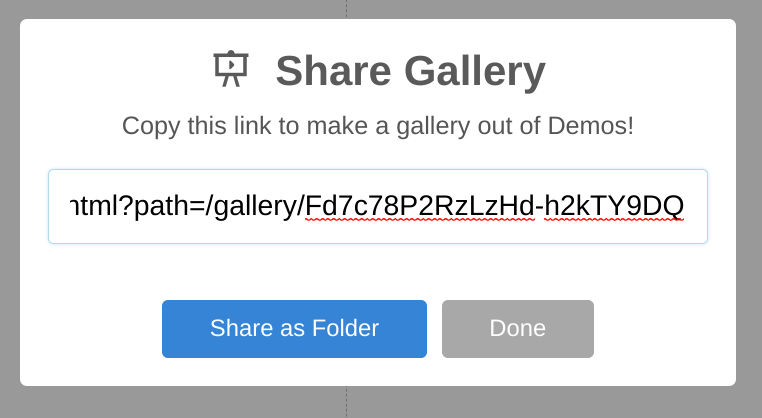 Previously, sharing a folder gave you a link that you could share with others to copy your folder into their account. You can still do that, but you now also have the option to share to a gallery where they can try your code without making a copy. To share a folder, you need to select the entire folder. You can do this by clicking on it. If you have opened a project inside the folder, though, go ahead and save your work, and click the folder name itself — twice! (Once to close the folder, since it was already open, and again to select it.) Once the folder (and not a project inside of it) is selected, you should see the “Share Folder” button on the bottom toolbar. Click it! By default, you get a link to share the folder for others to copy. To share as a gallery instead, click Share as Gallery, the blue button at the bottom. Now that you’ve got a link, you can send it to others. They’ll see a gallery that lets them click through your projects and try them out. Remember that sharing a folder as a gallery is still sharing the folder of code. Although it puts the running programs front and center, someone you share with can still access the code, either by clicking the link on the right of the gallery screen, or by copying the folder-share token from the URL and importing your shared folder into their own account. If you don’t want to share your source code, then you’ll still have to share one project at a time, by clicking “Share without Code” on the project share dialog. Software engineer at Google, volunteer math and computer science teacher, author of the CodeWorld platform, amateur ring theorist, and Haskell enthusiast.